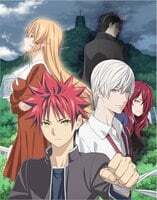 Plot Summary: This 3rd season continues the story of Yukihira Soma at Japan's premiere culinary school. This time around he's aiming for a spot in "The Elite Ten". These are the ten best students in the school who primarily decide which direction the school's curriculum will take. However, dark days are approaching as a former student returns and maneuvers into a position of power to usher in a new, bleaker direction for the school. At its darkest hour many students turn to Yukihira Soma to turn the tide.